Today I am observing Ekadasi, so I decided to do nothing. As a part of doing nothing, I am writing on my blog. It has been damp and overcast over the past few days, so a normal winter day was welcome. I went for a long walk in the warm sunshine after morning class and doing some asanas. This time I crossed the hydroelectric barrage that interrupts the Ganges’ flow and entered the Rajaji National Park. I don’t know why I had not done it before. It is a far more agreeable walk than going through the built up parts of Rishikesh, even better than the promenade alongside the Ganges behind the dam itself. Just outside the park’s entrance was a huge colorful billboard welcoming Krishnalal Advani, who came here a couple of days ago to celebrate some political accomplishment or another. The billboard shows a group of about 25 boys dressed in saffron, with the Shaivaite tripundra on their foreheads and the smiling face of their bearded youthful-looking guru. Svarga Ashram looked like a good destination at eight kilometers, so I started with the intention of covering that distance. The entrance to the park is marked by a sign, “Elephant zone.” I was rather hoping to spot an elephant or two, but I saw no wildlife except for a mere two monkeys, looking for remnants in a potato chip wrapper by the side of the road. They would have had better pickings in town, as the road through the park, though not pristine, was not the eyesore one gets accustomed to townside. And, of course, there were a few colorful birds, of which there are so many. I finally cut back on my ambition, only going four kilometers, as weakness from fasting, lack of water, and the need to be back for my Sanskrit class made me reconsider. But overall the walk was quite spectacular. The road, though not deserted, is not overly travelled. The gullies and ravines which the road follows are deep and the drops steep. It was pleasant to see so much unviolated greenery, so rare in India, even though the basic dryness of the climate is evident everywhere. There are many magnificent banyans and other species of trees that are not familiar to me by name. 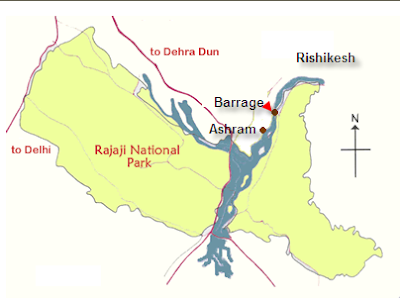 The occasional clearings gave beautiful views of the Ganges below and the temples and ashrams on its banks. I kind of wish I had a camera today. Got back with a bit of a headache, probably the result of dehydration and walking in the sun so soon after sirshasan and sarvangasan, but if the weather is good next Sunday, I will definitely try it again.